Darmstadt, Germany, September 19, 2018 – Tibetans and other well-wishers gathered to see His Holiness the Dalai Lama off from Rotterdam yesterday morning. The flight to Frankfurt took barely an hour following which he drove into Darmstadt. Among those assembled in the warm sunshine to welcome him at his hotel in the ‘City of Science’ were Tibetans, activists and journalists. His Holiness took the time to interact with them all, especially the children, shaking hands with some, talking to others and occasionally responding to questions. He seemed to be pleased to be meeting several old friends again. This morning as the early sunlight caught the rooftops in the vicinity of Ernst Ludwig Place, His Holiness drove around the block to reach the Darmstadtium Congress Hall. He was welcomed by members of the morning’s panel, notably Lech Walesa, Wolfgang Grader of the Tibet Initiative De, Hessian Minister of Finance, Thomas Schäfer and the Lord Mayor Darmstadt, Jochen Partsch. Rousing applause greeted them as they walked onto the stage. Wolfgang Grader gave a brief introduction. Thomas Schäfer told His Holiness, “You have been an inspiration to us; you have shown that non-violence is effective.” Grader expressed gratitude to the State of Hesse for its support and invited the Mayor of Darmstadt, Jochen Partsch, a prominent supporter of Tibet to speak. “It’s a significant event,” the Mayor remarked, “for our city to play host to three Nobel Peace Laureates. We’re honoured. At the same time, I’m aware that although we may experience a little diplomatic pressure, our support for Tibet doesn’t put us in danger of our lives as resistance does for people in Tibet.” He compared the German Basic Law, which is the German Constitution and the UN Charter for human rights and noted that the very first words of the Basic Law are, “Human dignity shall be inviolable”. Grader completed his introduction by harking back to 1989—a year of change. It was the year of the Tiananmen Massacre in Beijing, the year the Berlin Wall fell and the year His Holiness the Dalai Lama was awarded the Nobel Peace Prize. He stressed the need to promote human rights and basic human dignity. Finally, he announced that Tibet Initiative De is mourning the loss of one of its dearest founder members, Tsewang Norbu, who passed away unexpectedly a couple of weeks ago. Moderator of the day’s discussions, reputed journalist Dunja Hayali, introduced herself explaining that violence and non-violence are themes she has taken close interest in, as well as the abuse of power. Declaring herself excited to meet His Holiness, she framed a general question for the panel—how can non-violence help? What is the proper way to put an end to violence? Dardhon Sharling, Secretary of the Department of Information and International Relations of the Central Tibetan Administration (DIIR, CTA) explained that Tibet had been an independent nation until 1949 when it was invaded by the Communist Chinese and subject to military occupation. His Holiness escaped to India in 1959 after which the democratic CTA was set up. China, she said, wants complete control over Tibet, which provoked uprisings in 1959, the 1980s and 2008, followed by brutal crackdowns. Remarking that Mahatma Gandhi said that non-violence is a weapon of the strong, Hayali asked His Holiness for his thoughts. “Dear brothers and sisters,” he responded, “it’s a great honour to participate in this event. People are disturbed by violence and the desire for peace is increasing year by year. To achieve it we have to adopt a realistic approach, taking account of scientific findings that basic human nature is compassionate. After so much violence, what positive result has there been—none. Only more hatred. Violence is not the right method for solving problems. “I often tell people I meet how much I admire the spirit of the European Union. My physics tutor Carl Friedrich von Weizsäcker told me that during his childhood French and Germans only saw each other as enemies. After the Second World War, that completely changed. Violence arises when we divide people into ‘us’ and ‘them’, but in the case of Europeans, you all belong to one community. Since the EU was set up there have been decades of peace in Europe. “Attitudes to war and violence changed a great deal between the beginning and the end of the 20th century. Towards the end, people matured and withdrew their support for violence and the use of force. Taking this forward we should make this century an era of dialogue; we should sort out our problems by talking them through. We should also set demilitarization as a real target. “At a meeting of Nobel Peace Laureates transferred from South Africa to Rome, we discussed the reduction and elimination of nuclear weapons. I suggested that we set a timetable and hold the nuclear powers to it, but nothing happened. Our aim must be a demilitarized, nuclear free world, keeping in mind that external disarmament depends on internal disarmament. As human beings we all depend on the community we live in. Europe depends on the rest of the world. Crucial to peaceful relations are non-violence and secular ethics. Karim Wasfi former conductor of the Iraqi National Orchestra and founder of the Peace Through Arts Foundation, has earned a name for himself by playing his cello at the sites of bombings and other acts of violence. Here he provided a special musical interlude. Hayali introduced the members of the panel, Rebecca Johnson, a lifelong campaigner for non-violence and the elimination of nuclear weapons, is a leader of the International Campaign Against Nuclear Arms (ICAN) which was awarded the Nobel Peace Prize. Claudia Roth, Vice President of the German Bundestag, has represented the Alliance 90 / Green parties. She is a staunch supporter of the cause of Tibet and is active in campaigning against climate change. Lech Walesa was leader of the Solidarity movement and later became President of Poland. “On a global level we’ve seen too much suffering. Before the second war with Iraq broke out, millions of people across the world demonstrated against further violence. I have been impressed too by the commitment of Germany and Japan, both of which rose from the ashes of the Second World War, to peace. “In the case of Tibet—after signing the 17 point agreement, revolts broke out in Eastern Tibet in 1956, in the Northeast in 1957 and finally across the country in 1958-59. In March 1959 the whole population of Lhasa rose up in rebellion. Since there were threats to my life, I escaped, thinking to negotiate further with the Chinese from Southern Tibet. But once we’d left, they bombarded the city, so there was no longer any opportunity. Lech Walesa asked which people thought more unlikely, that Tibet would become free of China or that the power of the Soviet Union would collapse. In his opinion, the collapse of the Soviet Union was generally not even considered. And yet he recalls, in the midst of the Solidarity protests, warning Hans Dietrich Genscher, the capable German Foreign Minister that the Berlin Wall would come down. Rebecca Johnson remembered marching in the ‘70s to protect women’s rights. Later, women marched to support Solidarity. They marched to support Tibet. In due course they set up peace camps, such as that at Greenham Common to oppose the deployment of nuclear weapons. 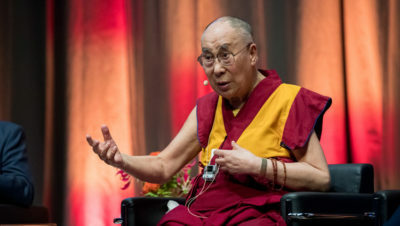 Claudia Roth told the gathering that she had been introduced to His Holiness by Petra Kelly and had always thought of the cause of Tibet in terms of human rights. She said His Holiness has not given up on peace and non-violence, asserting that the world needs people like him with vision to establish peace and human rights and put an end to militarization and dependence on weapons. Lech Walesa added that sometimes it’s necessary to ridicule your opponent to stop him being an opponent. Dunja Hayali asked His Holiness what he thought about monks and other Buddhists using violence against the Rohingya people. “When this crisis first broke,” he replied, “I was in Washington DC. Time magazine ran a cover with a picture of a Buddhist monk on it and the question, Buddhist Terrorist? I was shocked. I made clear my conviction that if he had been there, the Buddha would have given these Muslim brothers and sisters protection. I asked Burmese Buddhists involved in attacks on these people to remember the face of the Buddha. Hayali asked His Holiness to clarify his views on refugees. He told her that when people escape danger in their own lands it’s right to take care of them. “Aren’t there about a million refugees in Germany at the moment? Haven’t they been taken care of at the initiative of Chancellor Merkel? As the 1500 people in the hall erupted in applause, His Holiness expressed his gratitude to each of the speakers by giving them a white silk scarf. He and the panellists shared lunch together before he returned to his hotel. 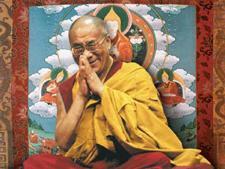 Tomorrow, His Holiness will attend an event in Heidelberg before travelling on to Zurich.